Hotels.com. Best prices. Best places. Guaranteed! If you have note already read it, click the arrow to the left for Part 1 of this adventure! We started out in a shaky people-carrier for the transfer to a tour bus. Yes, thankfully an air-conditioned tour bus for most of the way, but the 4x4 came in for the Atlas mountains leg, plus a horse and carriage for the oasis and a camel for the desert. Not bad, eh? We also had an overnight stop in a desert hotel, but I'm getting ahead of myself. Let's take it steady, it's a long trip. Actually, a trip we nearly didn't make after a lady at the hotel kindly informed us it was a tremendously long journey without air-conditioning and it was reported to be very, very tiring. Our tour rep assured us it was an air-conditioned bus, so we went ahead anyway. We can 'do' tiring. We've done that before. The pick-up time from the hotel was 05:10. Yes, in the early morning, that's right! But we were told we should be ready 10 minutes early, as is the custom. Hotel Reception told us 5am was the earliest the restaurant would be open (fairly impressive), but we explained that hardly gave us time for much breakfast if we were to be ready for the pick-up at the same time. Hotel shrug. So I talked to the waiter the night before. "No problem, come any time to the restaurant." Big beam. Thought I'd better confirm it with the hotel manager. "No problem, come any time to the restaurant. It is for you. Your holiday." Even bigger beam. They are so nice. So we got up nice and early and tried the restaurant at 04:30. Locked. Dark. Reception? Shrug. Didn't they tell us 5AM? So, after jamming down all the food we could find at 5AM — stale rolls and juice, all that was available — we waited around for the tour bus till 05:20. When a black people-carrier arrived and the driver came looking for us, our suspicions the lady had been right got stronger. Was this our air-conditioned transport? Only four of us booked the trip on that particular day from Hammamet, so it was inevitable we would end up in a people-carrier taking us and a couple from another hotel to join up with the tour bus starting out from Sousse. Lack of information was the problem, though. The trouble was it seemed like our worst nightmare come true when this shaky vehicle seemed to travel on and on as if this was our 'tour bus'. Its speed seemed frightening. The driver spoke very little English; it was less confusing for everyone to not even try holding a conversation with him. Although he did confirm we would be joining a bus... 'eventually' (as Manuel from Fawlty Towers would put it), and our driver did muster up enough English when he dropped us off at a Shell 'Boutique/Service Station' — not many of the clientele looked as if they were expecting a 'boutique' — to explain we could find toilets, food and water here. He would keep our overnight bags in the vehicle. Not knowing how long we would be there we made all haste. When we got back to the forecourt there was no sign of him or the vehicle. Panic stations, he had our overnight desert survival kits. A frantic search eventually revealed the vehicle somewhere else — now blue in the dawn light — and we hung around for a further one hour until the bus eventually arrived. Fateful though, for we made some great new friends in the same predicament. The bus was really full when we joined it. We were the last to board. All favoured seats had long since been chosen. H and I took an unfavoured seat half-way back, and I soon discovered why: the arm rest was broken. Everything else on the bus was fine: it was just my arm rest. But that's my luck, you see. The best news was recognition of the tour guide: Muhamid. We'd had him before and we knew he was good. He'd clearly read lots of 'bookses'. So on to the first stop: El Jem. 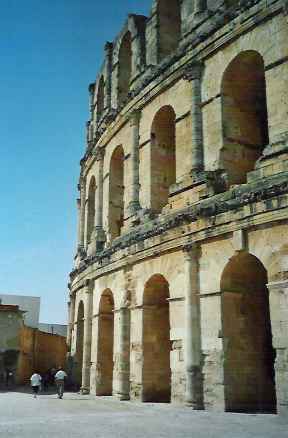 The main attraction at El Jem is the imposing Roman amphitheatre, even better preserved than the Coliseum in Rome — so they say. This amphitheatre is the 3rd largest after the one in Rome, apparently, and it is testimony to the wealth and civic pride of the Romans in the 'province' of Africa during the 3rd century AD. But why build it here, some 40 miles from the coast when wild animals had to be transferred to it from ships? Olive trees are the answer. This was where they were, where the people were, where the wealth was, and this is where the entertainment was required. (It gets boring for Romans in the desert. Nothing gets killed very often except for meals.) So, being Romans, they just 'did it'. Aquaduct from 15km away? Certainly no problem. Aquaducts-R-Us did a great job. Massive stone blocks from quarries 30km away? What are slaves for? Build it 149m long by 124m wide with tiered seats for some 35,000 people, rising to a height of 36m in just eight years, by hand? No problem for the Romans. We couldn't do it today with machines and cranes but, no matter, they could. They had very persuasive clauses in their workers' contracts, you see. You know what went on inside, of course. Gladiators battled either wild animals or convicts. The animals were regarded by Romans as outlandish exotics, and comprised African elephants and the Numidian lion. How did they get them there from the coast? Rumour has it they dug a tunnel all the way. Unlikely? Don't forget we're talking Roman engineering here, and the sight of the tunnel beneath the arena lets you know just what they were capable of achieving. A lot of its original height has gone, but you can still climb quite high and imagine what it was like to have a seat in the 'gods'! Nowadays things are much more civilised, here, of course. Get your timing right and you can attend symphony concerts during an annual festival. From there we headed south through increasingly sparse countryside until the olive groves gave way to sandy expanses with sparse growth. We were gradually penetrating the desert but this no-man's-land seemed endless. This is a land where Berbers still pitch their large cool tents and we saw several in the distance. After a long haul, we reached Matmata. A small township houses those who choose to live above the ground; shortly afterwards we were to see those who preferred to live underground in caves set around their individual protected inner-courtyards. These people were driven underground at Matmata long ago in order to hide from invaders — and they grew to like it! With outside temperatures soaring well above 40C, the constant 17C temperature offered by their cave houses grew more and more attractive. 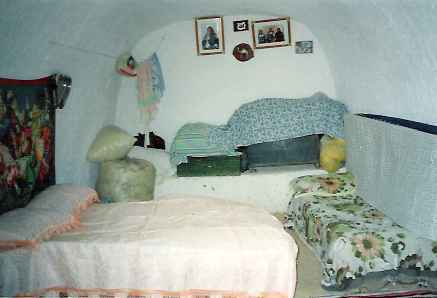 So much so that when the government offered to rehouse them in modern houses, the majority of the Tunisian troglodytes preferred to remain in their cave dwellings. Despite relatively primitive living, though, some now even have electricity. A few of them allow visitors to see their houses and share their gift of mint tea — and a small donation is expected in return. 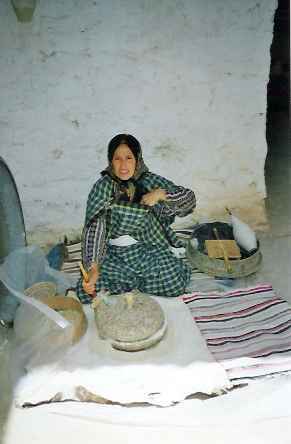 Here a Troglodyte lady is seen grinding in the ancient fashion. Traditionally the women spin on looms and the men cultivate the land, huge efforts going into damming fertile areas to retain as much of the infrequent rainfall as possible. The simple life these people lead is reflected in their simple possessions. It can make a possession-rich Westerner fell quite humble when these simple and happy people offer you a drink from the little they have. There are actually two hotels here offering bed and breakfast, but because there are not many rooms to go round, you may well find yourself sharing with several others: a strange hostel life, really. You need to be athletic to reach some of the rooms and actually shinny up a rope! One cave serves as a bar. The courtyard is surrounded by stools and guests may enjoy their drinks as they watch jugglers, belly dancers, and snake charmers in action. This land, and the bar described, were used in the making of the Star Wars films. We journeyed on to our overnight stop at a hotel in Douz and boy, did the heat hit you in an almost physical wave when you stepped outside that afternoon. Thank goodness for air-conditioning. There were those who took advantage of the hotel pool and even basked in the sun around it; basking here must be akin to being roasted on a spit, but there's no accounting for taste, I suppose. 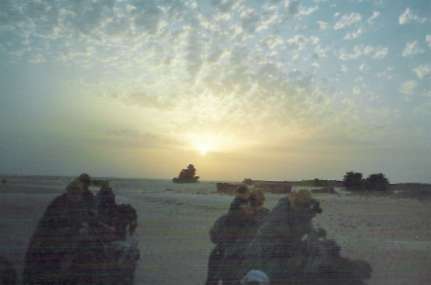 After a brief hour for revival, we were off again to the camel station for a ride into the Sahara Desert to enjoy a desert sunset. 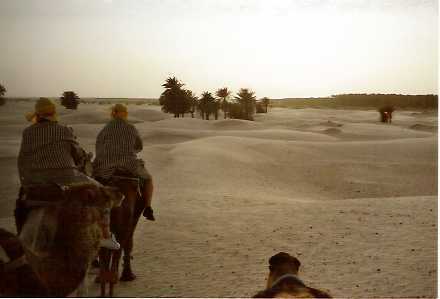 Once kitted out like Lawrence of Arabia, we mounted our camels and set out led in groups of four. No side-saddle seats here, we were properly mounted. Having met a few other camels in my travels, I have to say these were the friendliest. I got quite attached to H's camel who kept nuzzling my leg. (I didn't get to meet mine, properly, his head was too far away.) There was sand everywhere — not surprisingly — blowing up into places it should not ideally go: like the protective lens cover of my camera; it's never been the same since and has taken on a will of its own. The problem with the sunset shot was that you won't see the camels in the dark, and it is hard taking a picture from the back of a camel, anyway. I had to settle for a few minutes before sunset proper; even then, as you can see, everything gets a bit hazy. So, that was sunset taken care of. Next was sunrise. That meant a 4AM call, of course, but hey, what's that when you've practiced it the day before? Ancient seas disappear, surrounded by new mountains. Water fills them and inland salt lakes result. People cut out the blocks of salt. When we drove along the long road bisecting Chott El Jerid, setting for the film Raiders of the Lost Ark, this was what gradually came into view as dawn broke. 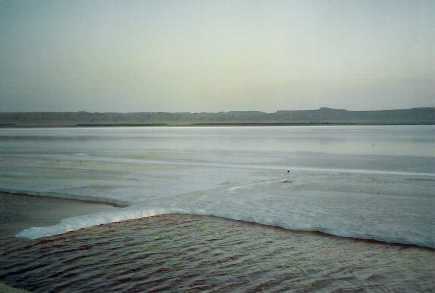 The thickness of the salt against the water where it has been cut away is quite surprising. 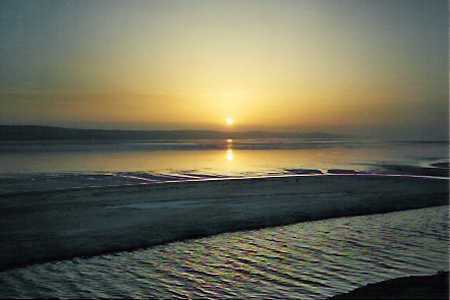 A strange place this, endless miles of salt in what is Tunisia's largest salt lake. It just sees amazing to see any water in this desert region; and here there's a huge expanse of it. 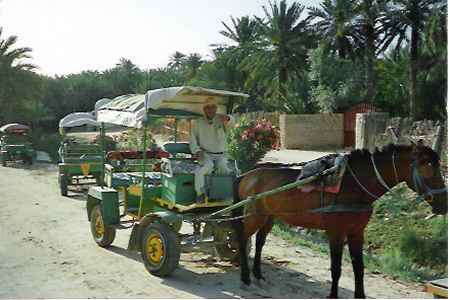 Snap-snap, pictures taken, then on for a carriage ride to see an oasis. A procession of horses and carriages stood awaiting for us. It was still well before 9AM and the day seemed long already! We were one of the first group of four to board our carriage — and then the last to leave in convoy, thanks to out laid-back driver who proceeded to sing away happily as he used a few words of the only true universal language as he pointed with a brown-gnarled finger: 'plant language'. I expect to see a little lake of water, being an oasis, but what we did see was the well-watered area of land that produces crops in abundance for many of the people in Tozeur; a well-cultivated jungle, you might say, with date palms to provide the much-needed shade, bananas, all sorts, if fact. 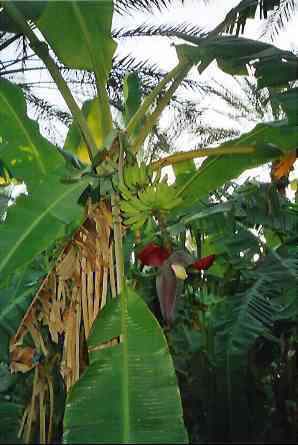 The picture shows a flowering banana there. While we were ambling around paths in the oasis with our splendid guide, we caught a glimpse of our driver wandering through the trees with two roses. He duly presented these to two ladies of our group on return to the carriage. What great customer relations this guy has. He might not have had any English but he had the language of flowers. Next stop the Atlas Mountains in a string of 4x4s; sorry, 'convoy', I guess. Our driver didn't have any English to offer us either, so he settled for an ever-repeating tape of Arabic music, heavy-beat, and it gradually gets into your subconscious. It was very hot in the vehicle and I eventually had to ask for him to switch on the air-conditioning. "Ah, English," he said with a knowing smile. Their summer season had not quite started so I guess it was still quite cold for him. Crossing the bleak desert flats with its green patches we saw a number of small groups of free camels grazing. Remember that camels are used for their meat as much as for transport. If you don't like that idea, remember that these people do need to eat, and the camel is about all that can survive in the rigours of this environment. 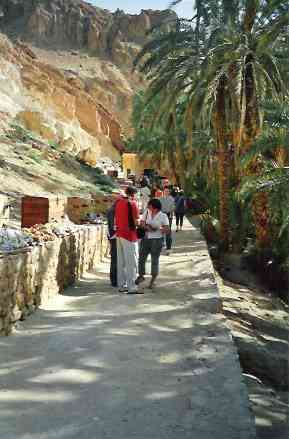 Eventually we reached Tamerza where we disembarked and took a hike. It began along a pretty-well defined walkway where locals hawked their fake painted crystals from chests, and eventually reached what they call the 'Lost Oasis of Chebika'. It seemed very much discovered to me judging by the mass of tourists there. It was still only mid-morning. 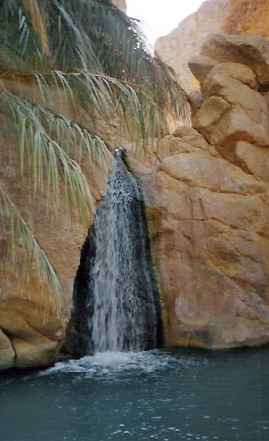 A blue oasis, a waterfall, date palms, croaking frogs, and then a steep ascent in anything but easy conditions up to a higher point in this small part of the Atlas Mountain chain. In need of some food after our 03:30 breakfast, we bought some bananas from a trader. To say they were over-ripe is no under-statement, but they were also very welcome. After this we toured a little around the mountains before returning to our air-conditioned coach and the long-long trip back to our various hotels and the end of a very full second day. Guess what. It culminated in the same bone-shaker people carrier. 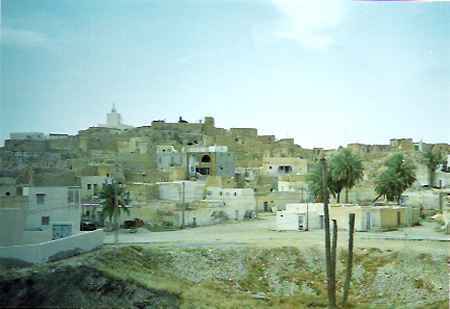 It was hot — very hot — as we sped back in it toward Hammamet, and it seemed even hotter after a truck overtook right in front of us — head on, barely a breath of life left for it to pull in — but our driver laughed. "Happens every day." Not to me. Thankfully. Did I say I thought the driving was pretty good here? I guess you need more time to make rash decisions like that. When I asked for the air-conditioning to be turned on as we practically expired in the heat, the driver pressed a button and just said, "Well, it was working when I left Hammamet." Yeah, right! So there you have it. Was it 'very, very' tiring as the lady said? No, just 'tiring'. But, hey, this little bit of 'tiring' gives you memories that last a lifetime. Well worth it, in my book. I dare people who have been to Tunisia and haven't got farther than their hotel pool and the beach to say there's nothing to see there. Such a view does not reflect Tunisia — merely their limited horizons! If you enjoyed reading the above article then you will probably also enjoy Irish Republic by Ed, and Kenya, also in Africa, and our latest articles covering the Orinoco Delta, La Mata, Marbella and Beijing.